Laxius Power is the 1st part of a unique, award-winning trilogy of RPG well-known for the sheer size of their worlds and their high degrees of non-linearity. Exploration has always been a key side of the saga, as well as the rich level of detail and interaction with the world if offers. 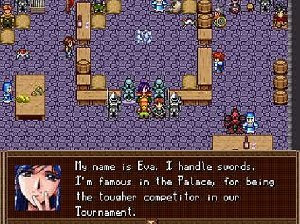 Enter an epic adventure as Random and his friends (Sarah the cute female Elf and Luciana the powerful female magician) journey up to SankT Leona, a legendary town where a Knight Tournament is meant to start soon. What does fate hold for them all? Play and find out! The game features 100 hours of gameplay (450 different locations), one of the biggest, most open-ended worlds ever created in a free RPG and addictive, non-linear gameplay. Be ready to play with 8 characters, each with their own unique spells, stats and personnalities, in more than 50 exciting quests.